Maria de los Angeles Guerrero Gonzalez was born January 30, 1846. She was born in Seville, Spain, and was one of 13 children, although only six of them lived to adulthood. Her father was Francisco Guerrero, a native of Grazalema, who immigrated to Seville. He mother was from Seville. Both of her parents worked in a convent of the Friars of the Trinity in Seville, her father was a cook, and her mother as a cleaner and seamstress. Her schooling was limited as was most girls of that social class in her time. Her name means “Maria of the Angels” and she was baptized at three days old in the Church of Santa Lucia, in Seville. She received her first communion when she was eight, and was confirmed in the faith at nine. At the age of twelve she went to work in a shoe repair shop to help the family income, and remained there almost continually until she was 29. Antonia Maldonado was a devout lady who was Angela’s supervisor at the shoe repair shop. She always encouraged her employees to pray together, recite the Rosary, and read about the lives of the saints. Fr. Jose’ Torres Padilla, a priest born in the Canary Islands, but established in Seville with a reputation for holiness, was Antonia’s spiritual guide. Angela was introduced to him at the age of sixteen, and he had a major influence on her. He became her spiritual director and confessor. At the age of nineteen, she applied to enter the Convent of the Barefoot Carmelites in Santa Cruz. She was denied because of her health. She was advised by Fr. Padilla to start working among the ill, particularly those suffering from Cholera, a disease that was prevalent at her time. Three years later in 1868 Angela applied again to Convent life, this time to the Daughters of Charity of Seville. She was still not well enough, but this time she was accepted. The Sisters attempted to nurse her to full health, but Angela had to finally leave the Convent during the Novitiate and return to work in the shoe repair shop. During this time, she kept a detailed spiritual diary, which revealed the style and life ideals that she felt called to live. On August 2, 1875 at the age of 29, three other women joined her. Josefa de la Pena who was wealthy, Juana Maria Castro and Juana Magadan, both from poor families like Angela’s. With money from Josefa, they rented a small room with access to a kitchen in Seville. They organized a 24-hour support service for the local poor and ill. In 1877 a second community was founded in Utrera, in the province of Seville. Still another one in Ayamonte, a year later. Fr. Torres died in the same year and Fr. Jose Maria Alvarez took his place as Director of the Institute. During her life, Angela became known locally as Mother Angela. 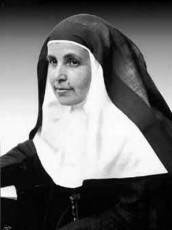 Mother Angela of the Cross, died in Seville on March 2, 1932 from natural causes at the age of 86. She was buried in the Sisters of the Cross Convent. Seventy-one years later, on May 4, 2003, her body was transferred to the Seville Cathedral as part of the celebration of her sainthood. Her body remained on display for a week in a glass coffin, until it was returned to the Convent. She was venerated on February 12, 1976 by Pope Paul VI, Beatified on November 5, 1982 by Pope John Paul II in Seville, and Canonized on May 4, 2003 by Pope John Paul II in the Plaza de Colon, Madrid. While in prayer in 1873, Angela received a vision that she understood was calling her to a mission of the poor, and she began keeping a spiritual diary to record what she understood of the life to which God was calling her. Many were attracted to her life, and on August 2, 1875, the Congregation of the Cross, was born. The Congregation works with the sick, the poor, orphans, and the homeless, providing them with food, medicine, housing, and other needs. They live solely on the Alms given, and keep only enough for themselves to continue their work. Starting with just Mother Angela and three Sisters, they had grown to 23 Convents during her life, and the good works continue today. Sister Angela of the Cross was born in Seville, Spain on January 30, 1846. She was one of thirteen children, and was one of six that lived to adulthood. She grew up working in a shoe repair store, where she prayed with the other workers, and met her spiritual director. She was very spiritual, and attempted to enter several Convents, to be turned away due to her health. She had a vision where she was to start a mission to help the poor. She and three of her friends started a house for the sick, poor, and hungry. Together they founded the Congregation of the Cross, and in her lifetime founded 23 Convents across Spain. Her good works continue today, through her Sisters and intercession.